Iain Vigurs celebrates after making it 1-0 Inverness. 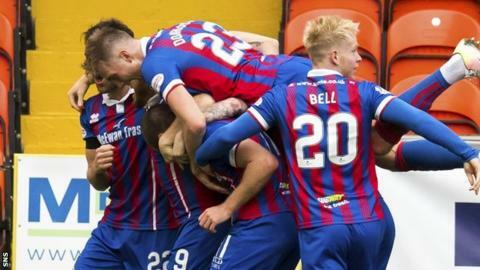 Inverness Caledonian Thistle won at Dundee United to move out of the bottom two of the Championship. Caley Thistle threatened twice through John Baird early on before Iain Vigurs scored the opener with a deflected strike from the edge of the box. Mark Ridgers immediately denied Scott McDonald an equaliser and Connor Bell tapped in a second for the visitors. United goalkeeper Harry Lewis denied Carl Tremarco, while Ridgers tipped over James Keatings' free-kick. After losing Fraser Fyvie through injury, Billy King's strike, deflected wide for a corner, was the closest United came to a consolation goal as the visitors comfortably closed out the win. Match ends, Dundee United 0, Inverness CT 2. Second Half ends, Dundee United 0, Inverness CT 2. Foul by George Oakley (Inverness CT). Foul by James Keatings (Dundee United). Substitution, Inverness CT. George Oakley replaces Iain Vigurs. Attempt saved. Billy King (Dundee United) header from a difficult angle on the left is saved in the bottom left corner. Attempt saved. Brad McKay (Inverness CT) header from the centre of the box is saved in the top centre of the goal. Substitution, Inverness CT. Charlie Trafford replaces Connor Bell. Attempt blocked. John Baird (Inverness CT) left footed shot from outside the box is blocked. Attempt missed. Mark Durnan (Dundee United) header from the centre of the box is close, but misses to the left. Corner, Dundee United. Conceded by Joe Chalmers. Attempt blocked. Billy King (Dundee United) left footed shot from outside the box is blocked. Substitution, Dundee United. Scott Fraser replaces Samuel Stanton. Connor Bell (Inverness CT) wins a free kick on the right wing. Substitution, Inverness CT. Alex Cooper replaces Jake Mulraney. Corner, Dundee United. Conceded by Mark Ridgers. Attempt saved. James Keatings (Dundee United) left footed shot from outside the box is saved in the top right corner. Attempt missed. Coll Donaldson (Inverness CT) header from the centre of the box is just a bit too high. Corner, Inverness CT. Conceded by William Edjenguele. Attempt blocked. Jake Mulraney (Inverness CT) right footed shot from the right side of the box is blocked. James Keatings (Dundee United) is shown the yellow card for a bad foul. David Raven (Inverness CT) wins a free kick in the defensive half. Attempt missed. Iain Vigurs (Inverness CT) left footed shot from outside the box is close, but misses to the right. Attempt blocked. James Keatings (Dundee United) left footed shot from outside the box is blocked. Attempt saved. Iain Vigurs (Inverness CT) header from the centre of the box is saved in the top centre of the goal. Corner, Inverness CT. Conceded by Scott McDonald. Substitution, Dundee United. Stewart Murdoch replaces Paul McMullan. Attempt saved. Carl Tremarco (Inverness CT) left footed shot from the left side of the box is saved in the bottom right corner.